If you've been reading my blog, you know that I recently went to Blue Mesa Reservoir (Curecanti National Recreation Area) on a camping trip. I thought of several topics that I will be writing about related to the trip, but to start with I wanted to give some initial thoughts about the trip. 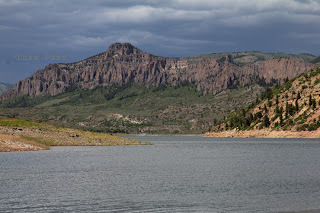 Blue Mesa Reservoir is the largest body of water in the State of Colorado, located along the Gunnison River, south west of the town of Gunnison. If you want to read my post about the basic stats of the lake, click here. We camped at the Elk Creek campground, which is located near the center of the lake along what is known as the "narrows," which is a narrow canyon. The Elk Creek Marina had several lanes for boat launching, a courtesy dock and a small store that offered basic groceries, tackle and boat rentals. Because of the location within the narrows, the area around the marina is a little more protected from the wind than the more open parts of the lake. We launched at Elk Creek the first two days, heading to the west into what is known as the Cebolla basin. We tried trolling with downriggers and leadcore, but only caught a couple small rainbows. In the afternoon of the second day I ran into Robby from Sportfish Colorado. He took the time to show me what he had been using out on the lake, how they were fishing it and even offered me some of the salmon that they had caught. Using the info from Robby and some help from the folks at the marina, we bought some Assassins and Squids to run behind dodgers. We also started launching the boat at the Lake Fork ramps. Long story short, we finally started catching more fish, mostly Kokanee Salmon. Over all we caught about 25 Salmon, four small Lake Trout and a couple Rainbows. I even ran into one of the guides from Gunnison Outfitters, who gave me some tips on how to fillet the Salmon. The end result was lots fresh Salmon fillets, which we will be enjoying for weeks to come. That was a quick overview of the trip, I will be posting more specifically how we were catching the Salmon, tips on getting the most success out of a fishing trip in new waters, using dowriggers and some other thoughts. If you haven't already, click on subscribe to keep up to date!